Gaithersburg, MD, April 10, 2019 --(PR.com)-- Keegan, an 8-year old boy living in Gaithersburg, Maryland, has received a very generous $10,000 Grant towards his very own Autism Service Dog from Service Dogs by Warren Retrievers, or “SDWR,” to assist him and help better communicate his needs. SDWR, a 501(c)3 non-profit organization located in Virginia, is one of the nation’s largest service dog providers with over 600 service dogs placed. SDWR is now serving over 1,000 families through its programs. 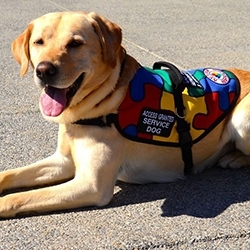 SDWR breeds, trains, and places service dogs to adults and children with invisible disabilities such as Diabetes, Seizure Disorders, Post Traumatic Stress Disorder, or in the case of Keegan - Autism Spectrum Disorder.